An extensive and thorough commentary on the Rome I Regulation – the first, to the best of my knowledge, to provide an article-by-article analysis of the rules of the new EC instrument on the law applicable to contractual obligations – has been published in the latest issue (no. 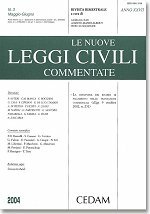 3-4/2009) of the Italian journal Le Nuove Leggi Civili Commentate , one of the most authoritative Italian law review, published bimonthly by CEDAM (Padova). The commentary (nearly 450 pages) has been edited by Francesco Salerno and Pietro Franzina (both Univ. of Ferrara), and has been written by a team of Italian scholars: Paolo Bertoli (Univ. of Insubria), Giacomo Biagioni (Univ. of Cagliari), Bernardo Cortese (Univ. of Padova), Anna Gardella (Univ. Cattolica del Sacro Cuore, Milan), Antonio Leandro (Univ. of Bari), Fabrizio Marongiu Buonaiuti (Univ. of Rome “La Sapienza”), Giuseppina Pizzolante (Univ. of Bari), Paolo Venturi (Univ. of Siena). The same group of PIL experts had already published, back in 2007, a volume discussing the 2005 Rome I Commission’s Proposal (see our post here). Introductory remarks: F. Salerno, F. Marongiu Buonaiuti; Art. 1: P. Bertoli (general comment and lit. i), G. Biagioni (lit. a-c), A. Gardella (lit. d–f), P. Franzina (lit. g–h), G. Pizzolante (lit. j); Art. 2: P. Franzina; Art. 3: A. Gardella, G. Biagioni; Art. 4: A. Leandro (general comment), P. Franzina (lit. a, c, d and g), F. Marongiu Buonaiuti (lit. b, e, and f), A. Gardella (lit. h); Art. 5: G. Biagioni; Arts. 6-7: G. Pizzolante; Art. 8: P. Venturi; Art. 9: G. Biagioni; Arts. 10-11: B. Cortese; Art. 12: A. Leandro; Art. 13: F. Marongiu Buonaiuti; Arts. 14-18: A. Leandro; Art. 19: F. Marongiu Buonaiuti; Art. 20: P. Franzina; Art. 21: G. Biagioni; Art. 22: P. Franzina; Art. 23: F. Marongiu Buonaiuti; Arts. 24-26: P. Franzina; Arts. 27-29: F. Marongiu Buonaiuti. A detailed table of contents is available here. Any chance that some of this material will ever appear in English?